Dried and ground coriander seeds. Coriander powder is used in Indian cooking to make a variety of dishes, such as Makki ki roti, Chicken Tandoori, Chicken Curry Dry, Jalebi, Laziz Ladd, Coconut Burfi. 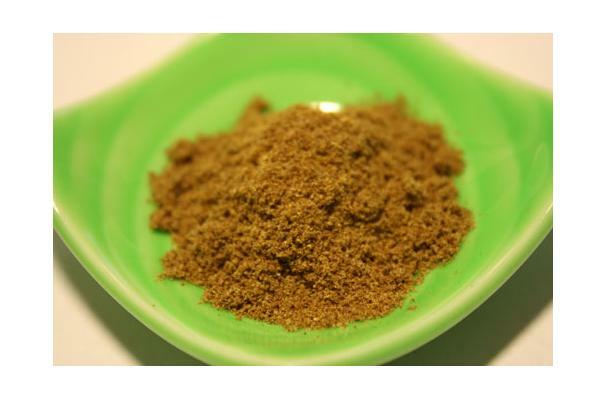 Made from Coriander, this is a finely ground powder to use in many recipes and herbal remedies. Procuring: The propagation of coriander is through seeds. Seeds can be sown directly in the garden or in a container or pot. Plant the seeds 1/2" to 1" deep, 2-3 feet apart in rows and rows should be 15" apart. Coriander traditionally germinates very slowly and can take as long as 21days to emerge. Ensure regular watering and that the soil is warm enough for speedy germination. The plant prefers well drained loamy soils rich in organic matter with a pH of 5.5 to 6.5. Soil should not be too rich with organic matter as too much nitrogen lessens the flavour. The plant requires partial shade but fairly high temperature and sufficient water. The plant can be kept in full sun but must be shaded during the heat of day to protect against sunscald. Too much heat can damage the fruit. They need a long season to ripen, so choose an early variety. Coriander leaves can be picked when the plant is immature i.e only a few inches tall. Fresh tender leaves have better flavour. But seeds ripen only after a long season say about 2 1/2 months before they are ready to be picked. Harvest seeds when fruits turn brown and before they shatter. Mature or ripe fruits have a distinct spicy aroma. Leave the seed heads in a dry airy place for 2-3days. Shake off the seeds and store for later use. Coriander (Coriandrum sativum) is an annual herb in the family Apiaceae. Coriander is native to southern Europe and North Africa to southwestern Asia. It is a soft, hairless plant growing to 50 centimetres (20 in) tall. The leaves are variable in shape, broadly lobed at the base of the plant, and slender and feathery higher on the flowering stems. The flowers are borne in small umbels, white or very pale pink, asymmetrical, with the petals pointing away from the center of the umbel longer (5–6 mm) than those pointing towards it (only 1–3 mm long). The fruit is a globular dry schizocarp 3–5 mm diameter. History: Coriander grows wild over a wide area of the Near East and southern Europe, prompting the comment, "It is hard to define exactly where this plant is wild and where it only recently established itself." Fifteen desiccated mericarps were found in the Pre-Pottery Neolithic B level of the Nahal Hemel Cave in Israel, which may be the oldest archeological find of coriander. About half a litre of coriander mericarps were recovered from the tomb of Tutankhamun, and because this plant does not grow wild in Egypt, Zohary and Hopf interpret this find as proof that coriander was cultivated by the ancient Egyptians. The Bible mentions coriander in Exodus 16:31: "And the house of Israel began to call its name Manna: and it was round like coriander seed, and its taste was like that of flat cakes made with honey."